The Shaheed Minar (Bengali: শহীদ মিনার Shohid Minar lit. 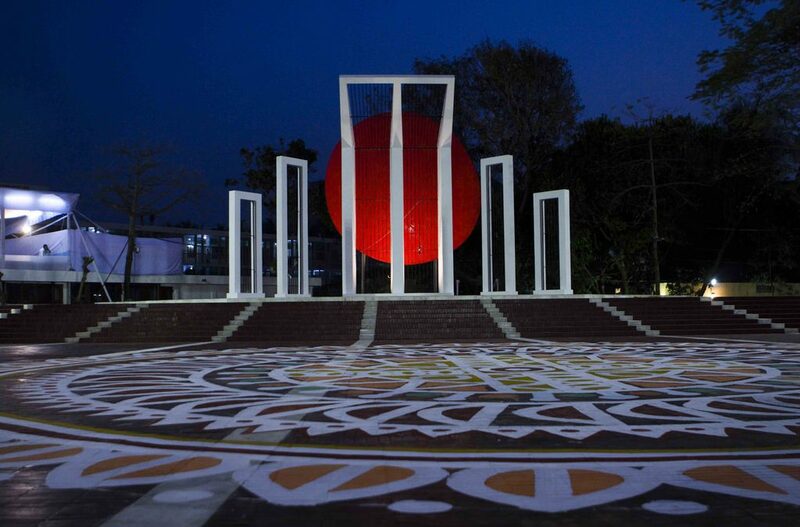 “Martyr Monument”) commemorates those killed during the Bengali Language Movement demonstrations of 1952 in what was then East Pakistan. On 21 and 22 February 1952, students from Dhaka University, Dhaka Medical College and political activists were killed when the Pakistani police force opened fire on Bengali protesters who were demanding official status for their native tongue, Bengali. A makeshift monument was erected but almost immediately demolished by the Pakistani police. Bengali gained official status in Pakistan (with Urdu) in 1956. This monument was completed in 1963 and stood until the Bangladesh Liberation War in 1971, when it was completely demolished. After Bangladesh gained independence later that year, it was rebuilt. It was expanded in 1983.